World renowned conductor Paul Hillier leads the Estonian Philharmonic Chamber Choir through Rachmaninov’s magnificent All-Night Vigil, often regarded as the capstone of Orthodox Church music. The breathtaking reading builds on a serene affirmation of religious faith, adding an array of timbral and harmonic effects and virtuosic techniques. After recording three discs together of Baltic Voices – that is, choral music by Baltic composers – it was inevitable that Paul Hillier and the Estonian Philharmonic Chamber Choir would record the Rachmaninov's All-Night Vigil, his a cappella setting of Vespers and Matins from the Russian Orthodox Liturgy. Paul Hillier is arguably the finest living conductor of spiritual choral music, a conductor with a complete mastery of the technique of singing and a consummate understanding of the transcendence of music. The Estonian Philharmonic Chamber Choir is probably the best Baltic choir, a chorus with the sonorous depths of the best Russian choirs, the supple strength of the best Scandinavian choirs, plus the soulful longing of the best choruses in the world. 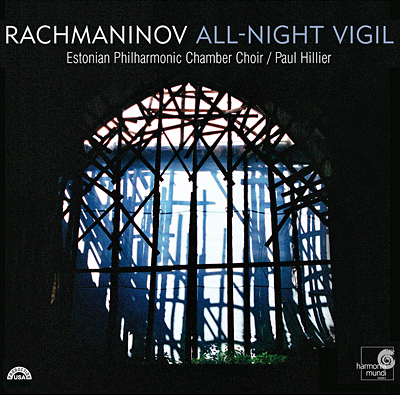 And, of course, Rachmaninov's All-Night Vigil is beyond all argument the greatest, the deepest, the most transcendent choral work ever composed by a Russian and one of the highest musical embodiments of humanity's spirituality. Together, Hillier and the Estonians turn in a performance of the All-Night Vigil of supreme musicality and sublime spirituality, a performance to convert the unconverted and bring the apostate back to belief. Harmonia Mundi captures the performance in sound that can only be described as stupendous. Recorded on May 24–27 2004 at the Dome Church, Haapsalu, Estonia.